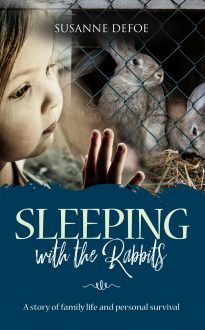 Susanne Defoe suffered parental violence and bullying at school on a daily basis throughout her childhood, finding comfort only with her pet rabbits: “One of my first memories was of climbing into the rabbit hutch and snuggling down into the straw to sleep… I just stayed there until they found me. I was only two and a half and I was missing for almost two hours.” Desperate to escape from her controlling father and ignorant mother, she found herself pregnant at fifteen by a boy who turned out to be a waster who spent all his wages in the pub. This is the story of how Susanne struggled to escape from a life of abuse, cruelty and ignorance to try to gain some self-respect and a decent life for herself and her four daughters.